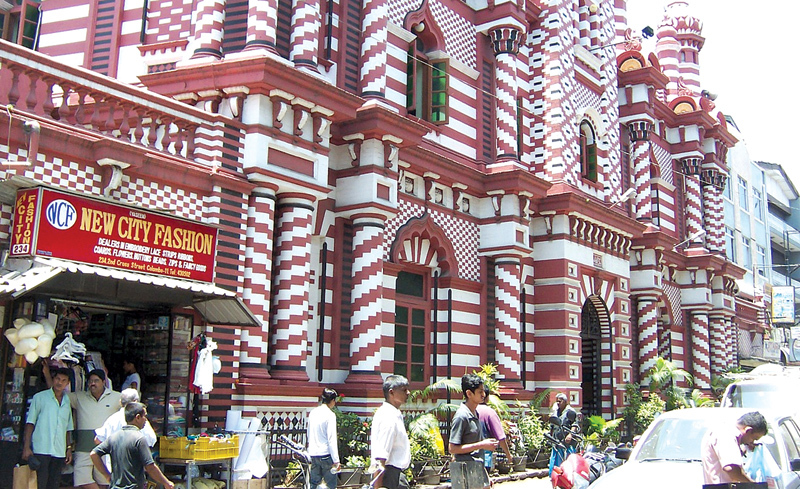 The Red Mosque in Pettah where religion stands side by side with business. Research tells us that if high population growth is coupled with low economic activity, resource scarcity becomes a prime concern and it becomes an ideal breeding ground for political and ethnic conflict. Sri Lanka has been no exception to the rule. There have been close to 50 incidents of racially motivated clashes between the Muslim and Sinhalese community since Independence, said Prof. M.A. Nuhman, a retired professor in Tamil at the University of Peradeniya. Prof. Nuhman having written scores of literary papers and books on the Muslim community in Sri Lanka noted that every single time such a clash occurred, it almost always revolved around business. The Muslims, be it the Arab and Indian traders or the Malay soldiers who came to the island, have for centuries been regarded as a mercantile class in the island. 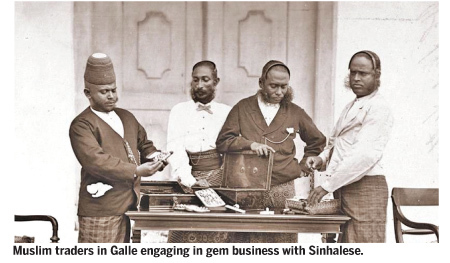 During the Buddhist revivalist movement and even earlier, this image did not sit well with many in the majority community who were also getting into trade and a new Sinhalese ‘middle’ and ‘merchant’ class developed. “Sinhalese nationalism was deep rooted among the majority by Anagarika Dharmapala and that image still continues,” explained Prof. Nuhman. Dharmapala, a Buddhist revivalist, whilst reawakening the national conscience against the British also painted a picture of the ‘Muslim’ as an alien who profited off the Sinhalese through Shylockian methods. This imagery stuck long enough to be the embers that lit the first Sinhalese-Muslim riot in 1915. “In my point of view, even today the underlying problem is more commercial. The competition has always been between the mercantile classes. In the meantime, the problem has taken a different shape following extremist activities carried out by some Muslims,” continued Prof. Nuhman. The incidents of violence in Galle, Puttalam and Mawanella centred on conflicts between local businessmen or traders of the two ethnic groups which later inflamed into a wider ethnic conflict. Hence one way to understand the instances of anti-Muslim violence is to see it as being driven by the ethnicisation of the vertical conflict between working class poor Sinhalese and the Muslim bourgeoisie that simultaneously induces horizontal conflict on ethnic lines within the working class poor and vertical alignment between classes on the lines of ethno-religious identity. Also central to the mobilisation of the Sinhalese working class and poor, was the alliance or alignment, most visible in Puttalam and Mawanella, between the Sinhalese bourgeoisie and the temple or the Buddhist clergy buttressed by local Sinhalese political interests who commanded ‘muscle power’. The involvement of the local Buddhist clergy was critical in both legitimising anti-Muslim sentiment as well as in providing a physical and spiritual-religious locus for such sentiment and its eventual translation into violence. Interestingly, every time such violence broke out, be it in 1982, 2001, or even during 2013 when there was increasing animosity towards the Muslim community, they were periods where the country’s economy was struggling. In 2013, the real GDP growth rate had drastically dropped to 3.4 percent from 9.1 in the previous year. When we had one of the worst clashes in Mawanella in 2001, the economy recorded a negative growth rate of -1.5 percent. The last four years have suffered economic stagnation with the GDP growth rate resting around 4 percent mainly due to high debt repayments, low economic activity, and the worst drought in 40 years. Whilst the attacks during periods of low economic productivity keeps to theory, the question still remains as to why it is the Muslim population of the country that have won the perception of being ‘successful’ when everyone else is struggling. Prof. Nuhman pointed out that whilst Muslims were targeted based on their economic status, not more than 20 percent of the Muslim population in Sri Lanka was wealthy and this was the same with every community. Further for decades, he pointed out, there was widespread poverty within the Muslim community which had led to the low level of education within the community. “If you take a walk in the slums of Colombo, there is a higher number of Muslims than any other group,” added Vice President of the Muslim Council of Sri Lanka (MCSL) Hilmy Ahamed. “But the perception is that we are a very rich community.” According to him, it was ‘perception’ that has become the biggest problem. “You see a small number of very rich Muslims driving around in flashy cars and having big weddings. So people think all Muslims must be rich,” he said. “The current generation of Muslims are not interacting with non-Muslims. This is mainly due to the education system we have. We have Muslim schools and Muslims find it very difficult to enter non-Muslim schools. Then they go set up international schools and segregate their children. Currently, Muslim children are growing up without knowing a non-Muslim. As a result no party has an understanding of the other’s religion or ethnicity,” said Ahamed. Director Research of the International Centre for Ethnic Studies (ICES), Kandy, Prof. Tudor Silva reiterating Ahamed, said the Sri Lankan education system was at its core, ethnically segregated. “There is a need for more interaction among young people and an inclusive identity should be promoted,” he said. Without such inclusivity, the present education system, on the other hand, is highly influenced by racial ideas, added the Professor. However, former President Chandrika Bandaranaike Kumaratunga who took initiatives to change the prevailing education system met with great opposition and no progressive decisions were made. At the time, it was reported that the former President received criticisms from the Sinhala nationalists for trying to create an equal space for students irrespective of religion or the culture they follow. Today, anyone who wishes to change this status quo is bound to face attacks from all sides of the spectrum. Prof. Silva who placed little hope on the current initiatives for change, emphasised that there was a “huge problem of us versus them” and it played a major role in our society. These misunderstandings coupled with the changing religious and political environment in the country have become a hotbed for ethnic conflict in the country. The class struggle between the communities has been transformed into an ethnic struggle. Now the ethnic division is more strong and powerful than the class division, observed Prof. Nuhman. In the late 19th century, the elites in all communities who were ethnically sensitive and politically motivated led their respective communities to the modern era through their revivalist activities, writes Prof. Nuhman in his book on Sri Lankan Muslims. Muslim revivalism, Prof. Nuhman noted, was also pushed in reaction to the revivalist movements of the Sinhalese and Tamil communities, and later on, we see a similar trend in communal politics taking centre stage in the Muslim community with the development of Tamil militancy in the North and East. The second wave of development of Islamic awareness, according to Prof. Nuhman, came in the form of the establishment of a large number of Arabic Colleges and da’wah movements from the 1950s onwards. Jamaat-e-Islami, Tabligh Jamaat and Tawhid Jamaat were all established during this period - each of them proposing a more ‘purer’ form of Islam to its followers. Adding to this, in 1973, Jaamiya Naleemiya initiated a different kind of madrasa education - it was the only Arabic College affiliated to the International Islamic University of Islamabad and proposed to combine traditional religious teaching with non-religious education. At the end of their education, young boys are qualified to preach in mosques around the country. This would mean that progressively over the years, the spiritual outlook of the community would change and become more insular. Dr Akbar S Ahmed, the Ibn Khaldun Chair of Islamic Studies at the American University in Washington DC, states that the Muslim response to Western colonisation which developed in the 19th century and persists until this day, can be divided into three groups; the modernists, literalists, and mystics. The modernists of the 19th century sought to adapt Islam to Western modernity and promoted the learning of science and attempted a programme of reform to adjust to the times. The literalists, the second category, also arose in the 19th century, but instead of attempting to balance Islam and the West, they sought to draw boundaries around Islam. They saw Islam as under attack from the West and attempted to preserve its purity by going back to the holy texts and attempting to interpret them literally. This included attempts to exactly emulate the behaviour of the Holy Prophet (PBUH) of Islam, for instance, by dyeing their beards. The literalists drew their inspiration from thinkers like the 14th century scholar Ibn Taymiyya of Damascus, who wrote as the Muslim world reeled from the Mongol invasions and believed that Muslims in every generation must revert to the holy texts rather than applying mindlessly the teachings of current scholars. The third category is the Sufi mystics who see the love of God as the reality underlying all things. Intellectually and spiritually they transcend distinctions of religion and nationality. Their message of sulh-i-kul, or peace with all, resonates with people across the social and economic spectrum in Muslim societies and indeed even in non-Muslim ones. In Sri Lanka today, like in many parts of the World, the literalists are winning the day. “Muslim religious leaders in Sri Lanka are very conservative,” said Dr Nuhman. The stalling of reforms to the Muslim Marriages and Divorces Act (MMDA) is the best example of it and they are the culprits. They enjoy all novel technologies, but ideologically they are backward.